Models from Rainbow Nation Little Charmers modeling academy. Little Charmers have hosted their 5th Annual Charity Show where former president Nelson Mandela's daughter Zindzi's children Zazi (8) and Ziwelene (6) launched the Mandela family's first children's story book titled Grandad Mandela. Singer and songwriter LeAnne Dlamini emceed and entertained guests at the event whose proceeds were donated to the Nelson Mandela Children's Hospital in Johannesburg. 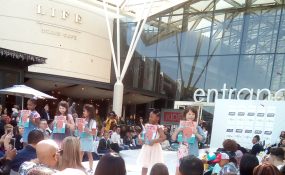 Children from Rainbow Nation Little Charmers modeling academy showcased the latest fashion from stores like MR Price Kids, Cotton on Kids, Guess Kids while random adults were picked from the crowd to model for gift vouchers. Zazi and Ziwelene also took to the stage alongside their mother Nondzolo Lindo Mandela to launch the picture book that explains Madiba's role in ending apartheid. The book was written by ambassador Zindzi Mandela, Zazi and Ziwelene. It is available at Cotton on Kids store. A raffle draw was run and the generous winner donated his R10,000 worth of goodies prize to the Mandela Children's Hospital. Little Miss and Mr Charity were crowned for selling the highest number of tickets to the show. A cheque of R60 000 rands was donated to the children's hospital at the end of the show. The 'Little Charmers Charity Show' was born in 2014. The aim of the events is to teach children the importance of giving back by ticket sales to generate funds for a selected organisation involving children. This year's show was dedicated to Madiba's legacy.